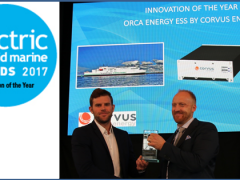 Scandlines’ newly launched hybrid ferry, Berlin, uses a low-emission and fuel-saving diesel electric hybrid propulsion system powered by an energy storage system (ESS) from Corvus Energy. Berlin, which was christened on 3 May, is the fifth Scandlines hybrid ferry to use a Corvus ESS, which provides 6,000kW of the total 15,800kW of power needed by its engines. This allows the ferry to operate at a speed of 20.5 knots on her two-hour crossing between Rostock, Germany and Gedser, Denmark. The vessel is also equipped with various other energy-saving technologies including an optimised propulsion system consisting of propellers and two thrusters, as well as LED lighting. Any excess energy is stored in the Corvus ESS so it can be released when Berlin’s energy consumption is higher than generator production.